In 2017 we proceeded to making olive oil from our olive grove located in Petralona which we manage using organic means but is not under an organic certification program. 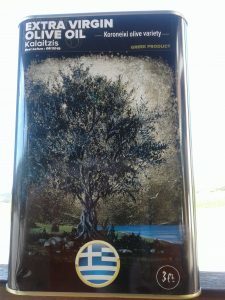 Its variety is Koroneiki, 100%, which is well known for the high quality olive oil, rich in aromas and taste, while at the same time the analysis we have from the Kapodistrian University of Athens has shown a good content in phenols a nutrient that helps ones body for good health. It is available in 3 lt cans.